During the school holidays we've been doing the usual things like visiting the museum and art gallery. My kids love the museum shop and always like to look at the posters. Caspar already had the Insects of Australia - Guide to the Orders, hanging on his bedroom wall. On our last visit, he picked up the Australia's Insect Giants - Life Size (the insects are all life size!). These posters are under three dollars each are they really beautiful, educational and scientifically accurate. Caspar has also asked for a poster of the periodic table. I've been looking around as I wanted something visually appealing. 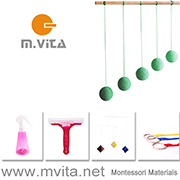 Very few Montessori classrooms have educational posters on the wall, most have beautiful art prints or paintings. Sometimes you might find a poster near an area like the nature table or if there is a study unit area - like birds or insects as an example. At home, I think they can enhance a learning space and be used to beautify the environment. In the children's bedroom, posters can be a form of self-expression, which is why I believe it's important the children choose them themselves, not have something imposed on them. So did I find a beautiful poster of the periodic table? I think so. I ordered this one from We Are Squared. Here are a few gorgeous posters I found on my search (as pictured above). 1. & 3. Designer scrolls at Nestling, each one features work by a different Australian illustrator. Found via Design Files. 2. Abstract Rainbow - perhaps for learning colours. I love colourful spaces and this is gorgeous! By Blink Designs. 4. 5. & 8. 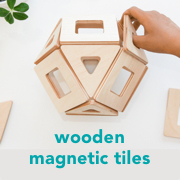 We Are Squared has a fantastic, simple and modern take on educational design. They are also affordable. 6. & 7. From National Geographic. The Giants poster is (at the time of publishing) available in store at the Queensland Museum. 9. Illustration by Danielle Sandeman at Simple Form. And some other posters I really love, there is almost a poster for every area of interest! Whale Canvas by Arminho but also at The Scientist Collective. Field Guide Art Prints by Kate Dolamore. Minerals Poster (Caspar has previously had this on his wall). The boys also have the Rainbow In Me (a Kids Chakra Poster) on their bedroom door. The museum and places like National Geographic have great educational and affordable posters. Maps and photographs of geographic locations can also be special pieces to put on a child's wall. I've had a few readers message me about the We Are Squared posters - so thank you for your tips! Edited to add (27th December) - Locals might like the Native Bees of Queensland or Native Bees of the Hunter Region by illustrator Gina Cranson.